New Paper “Parameterization Of Instantaneous Global Horizontal Irradiance At The Surface. Part II: Cloudy-Sky Component” By Sun Et Al 2012 | Climate Science: Roger Pielke Sr. 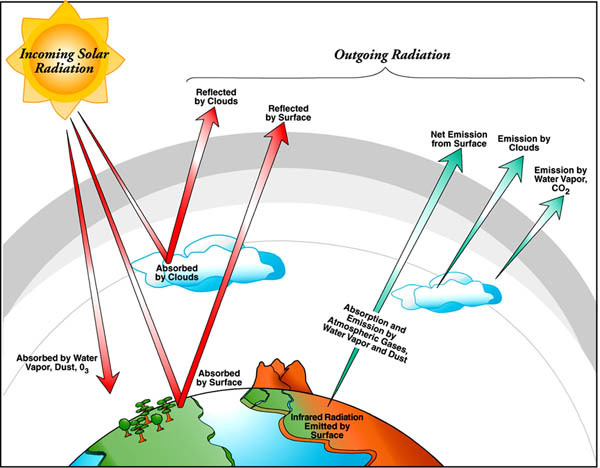 Radiation calculaions in global numerical weather prediction (NWP) and climate models are usually performed in 3-hourly time intervals in order to reduce the computational cost. This treatment can lead to an incorrect Global Horizontal Irradiance (GHI) at the Earth’s surface, which could be one of the error sources in modelled convection and precipitation. In order to improve the simulation of the diurnal cycle of GHI at the surface a fast scheme has been developed in this study and it can be used to determine the GHI at the Earth’s surface more frequently with affordable costs. The scheme is divided into components for clear-sky and cloudy-sky conditions. The clear-sky component has been described in part I. The cloudy-sky component is introduced in this paper. The scheme has been tested using observations obtained from three Atmospheric Radiation Measurements (ARM) stations established by the U. S. Department of Energy. The results show that a half hourly mean relative error of GHI under all-sky conditions is less than 7%. An important application of the scheme is in global climate models. The radiation sampling error due to infrequent radiation calculations is investigated using the this scheme and ARM observations. It is found that these errors are very large, exceeding 800 W m-2 at many non-radiation time steps due to ignoring the effects of clouds. Use of the current scheme can reduce these errors to less than 50 W m-2. These errors are clearly larger than the few W m-2 that are due to human climate forcings, and even large relative to the natural variations of radiative fluxes. This is yet another example of why the IPCC models are not robust tools to predict changes in global, regional and local climate statistics.